North Carolina has emerged as America’s mecca of microbrew. Every corner of the state, from the coast to the Great Smoky Mountains, is sprinkled with craft breweries, and Jackson County is no exception. The Western North Carolina county is home to the Jackson County Ale Trail, a walkable route linking two distinctly unique breweries in downtown Sylva. 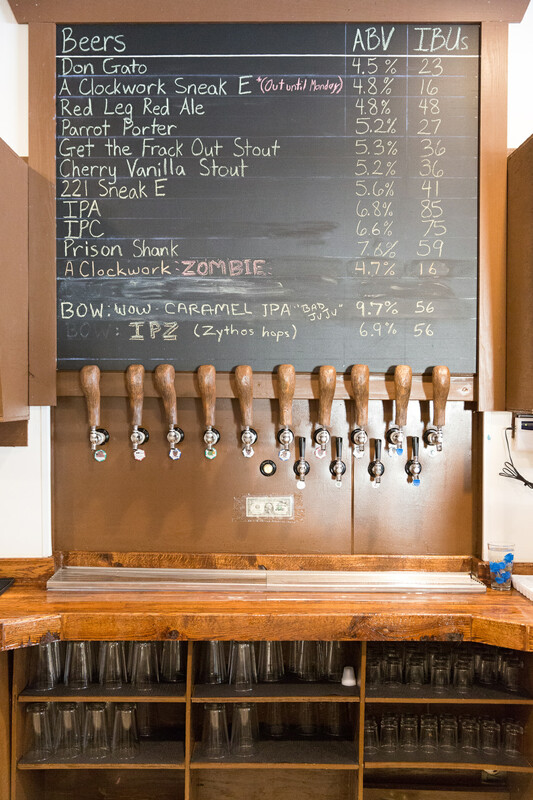 The trail currently connects the Sneak E Squirrel, a whimsical place housed in a repurposed car dealership, with the creekside Innovation Brewing, which regularly has more than 30 different beers on tap. Slated to open later this summer, the Balsam Falls Brewing Company will be the trail’s newest addition, with a revolving rotation of 16 to 20 beers on tap. The owners, Corey and Laurie Bryson, plan to incorporate fruits, vegetables, and herbs into their brews, many of which will be grown locally. The range of craft beers on tap in Jackson County are as diverse as the people who enjoy them. And beer choice says a lot of about the pint holder. You live boldly, like your beer. Polar bear swims don’t phase you. The High Falls dam release days are marked on your planner. And when you want suds, you crave an audacious beer: the Prison Shank. This quintessential English Strong Ale is Sneak E Squirrel’s most punch-packed selection, with both the highest ABV (7.6%) and one of the highest ratings on the IBU scale (59). Just like you, it’s not for the faint of heart. At a bar somewhere, you’re a recognizable regular. You’re a trusty mainstay in a sea of change, just like your beer—Innovation Brewing’s Spaceman Ale (5.4% ABV). At a brewery built on innovation and experimentation, with a perpetually evolving seasonal tap list, you still stick with the archetypal American Pale Ale. Why tamper with a classic? A Clockwork Zombie is one of Sneak E Squirrel’s many fun brews. By the first of October, you already have a Halloween costume picked out. You have a weakness for dystopian novels. You are currently writing a post-apocalyptic screenplay at night—just for fun. Whenever you peruse the board games at the Sneak E Squirrel, you always secretly want to the choose Star Trek Catan. And when presented with the brewery’s tap list, A Clockwork Zombie (4.8% ABV) is your perennial pint choice. The yeasty Belgian Wit features a tart and tasty blend of pomegranate and cherry flavors—a fusion first created in honor of Halloween. But you love the spicy, aromatic beer year-round, and it’s not just because you appreciate the creepy name mashup. Secretly, you want to own a brewery, and you’ve already dreamed up witty names for all the beers you’ll have on tap. At Innovation Brewing, you usually lean toward the inventive seasonal blends (like the Hibiscus Rose Hip Wheat or the Blueberry Basil Belgian Ale) but you can’t resist a funky sour beer, especially a recently unveiled one. One of the brewery’s newest sours, the blonde-based Niagara Grape Sour (7.1% ABV) is flavored using locally-harvested grapes sourced from Calaboose Cellars. But you already knew that, because you just as well-versed in wine. You consider bacon the foundation of any meal. Much of your wardrobe is flannel. If you could, you’d cook every meal outside on the grill. You know the rugged wilderness of Panthertown Valley like the back of your hand. And you have a weakness for robust brews with character. You relish hearty beers, suitable for winter hibernation, like Sneak E Squirrel’s Get the Frack Out Stout (5.2% ABV), a rich, malty Irish-style stout. You’re inclined to crack a beer while doing yardwork, and may dream up reasons to putter around your garden. You are a champion of responsible day drinking. You can spend a whole afternoon floating around Lake Glenville. You see beauty in the mundane, and there’s no better way to pair a day outside than with an Afternoon Delight Blonde Ale (4.3% ABV). The smooth blonde ale is your gardening go-to on the weekends, and hits the spot after a long day at work, too.